Well that was fun. I've never done Inktober before. Monday, May 19th was the opening of Spring Show! Spring Show this year is being hosted at 2225 Jerrold Ave. San Francisco, CA 94124 and will be open during the week from 10am to 6pm (closed Sundays and Mondays). It's a time where the school displays the best of the students' work from all the different departments which is an amazing sight to see. I never even knew that there was a paper sculpture class. More important than the Spring Show opening is that prior in the day is when Career Day happens and all the graduating students anxiously wait in line to interview with many various companies, such as Disney, Laika, Blizzard, Dreamworks, Method Studios, etc., that come. Since I'm not graduating yet I'm not actually allowed to be interviewed but I volunteered as a runner partially in hopes of being able to speak briefly and get to know more recruiters. Apparently the Laika recruiter, Anna Kvorning, saw my work in the show and liked it and asked for me in person so when I arrived ready to volunteer I was immediately whisked off to wait in line for an interview. I was freaking out while waiting in line as I was prepared to be volunteering and running around so I was not dressed formally enough as I usually would for an interview and I had no tablet to show my work on. Everything ended up goig well though and I guess I was allowed this one interview since it wasn't actually for hire but Ms. Kvorning just wanted to talk and tell me about the fall internship opportunity. An extremely cool feature at the animation and vfx exhibit is that some of the posters have been augmented with an "augmented reality browser app" called Aurasma. It is available on both iOS and Andriod. Download the app, and search for the AAU channel and follow the channel. Use the app on the poster and it will sync with the camera and begin playing the video on top! You can move around and the video will be tracked to the poster. I like painting female characters as I feel that there is a lot that can be done with them. They can have some very nice dresses with lots of folds, wear lots of shiny jewelry, ,can have some beautiful makeup on to enhance or highlight facial features, and can have some nice flowing luscious hair. Unfortunately, being male, I can't always use myself as reference and I won't necessarily always have someone nearby handy to be my reference. Here is a great, fun, and funny tutorial by Meghan Hetrick on one of the aspects of females. How to draw boobies. Back during winter break of last year, 2013, I requested photos from friends so I could use them as references to paint some portraits. As I have been so focused and busy on the work of animation I hadn't actually done any serious drawing and painting for a long time and really wanted to get back into it. I was even more motivated to get back into it after going to CTN and seeing all the amazing artwork. I had five friends who responded and I started to get working. I didn't finish all of them in time, particularly as during the second half of my winter break, the Riot digital art contest came up. I've finally completed the last one sometime earlier this summer. "Completed" is a pretty loose term as I don't think that they're completely finished. I gave myself two to three days to see what I could do, explore, and push myself. Maybe I'll go back and polish them some more at a later time. One thing that I have been really wanting to achieve is that soft airbrushed quality look that I often see in digital paintings. For some reason I can never achieve it. It may be due to my background in oil painting where my professors were very against the concept of illustration. They believed that art should be about art and the medium so I always had to put a lot of paint on my canvas and to leave brushmarks in instead of smoothing things out. Evangeline Spracklin This was the very first one I did so just to ease myself back into painting I went a pretty straightforward standard route. If I was to redo this now, it may be a little cliched but I would love to put her on the Throne of Swords from Game of Thrones and used a lot of that stark moody lighting. Kunal Vaswani The only portrait of a male that I got to do, and also Indian. What was additionally interesting was analyzing how form changes due to the refraction from his glasses. I notice that it sort of seems like he is missing an arm due to the angled pose he is standing in. I do feel that extending it out might make it look unnatural and also it would break the nice squared off form that I was going for with the shoulders of the suit. Also, I hate painting black hair as I find it ridiculously hard. Since it's so dark it's really hard to get depth in it and if I try to add highlights it just looks like white/graying hair. Anna Hayden In CG lighting we always talk about rim lights and how they help give an object form but the issue is that rim lights don't really occur that often in real life unless you decide to walk around with a light shining right behind you. Nonetheless I wanted to try a painting with a strong rim light. Anna had this clasped hand pose that reminded me of Albrecht Durer's self portrait where he posed in reference to many of the Jesus portraits so I decided to do sort of a sky/angel sort of thing, complete with a yellow halo. Ashley Prescott I decided to go looser for this portrait and did it all with a rectangular brush instead of my normal set of brushes I use for painting. Ashley was a DXArt (digital and experimental art) major so it was even more perfect as I thought I would make it as artsy-fartsy as possible. I furthered that by sticking her coming out of a picture frame but with another picture frame in the back. Stripes are always interesting. I never know if I should painting the stripes in first with a base and then paint shadow and highlights over it on a separate layer or if I should paint the darks and lights as I paint the stripes folding around the shirt. Melissa DeBarr I wanted to do something with really dramatic lighting. Melissa loves Batman so I looked to the poster for The Dark Knight to see if I could do anything with that. The poster itself is very stylized with a very blue lighting and a large fiery orange in the back. Over at CGSociety, Kirt Stanke hosted a small challenge in the Works in Progress forums asking artists to pick a card from a standard 54 playing card deck. This challenge started back in April and I joined in during May thinking that I will have time since the summer is starting up. That was a huge mistake as the many collaborative projects that I joined in on continued over the summer and it took up the majority of my time. Thankfully the deadline was extended so I was finally able to finish my painting up. 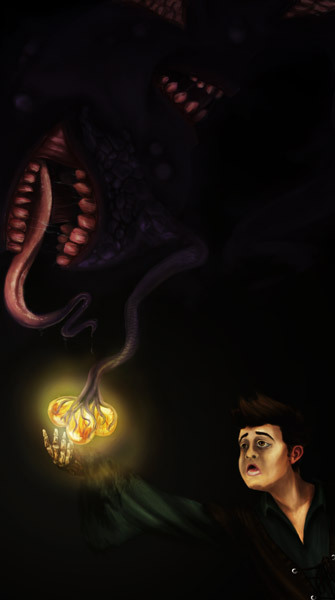 However, it was somewhat strange/weird/awkward that I got absolutely no feedback on my work as I posted my progress. I don't know if I'll win anything but if I miraculously win first place, the award is a free CGWorkshop and I know the one that I will immediately go for is Justin Holt's Mari 2.0 workshop. 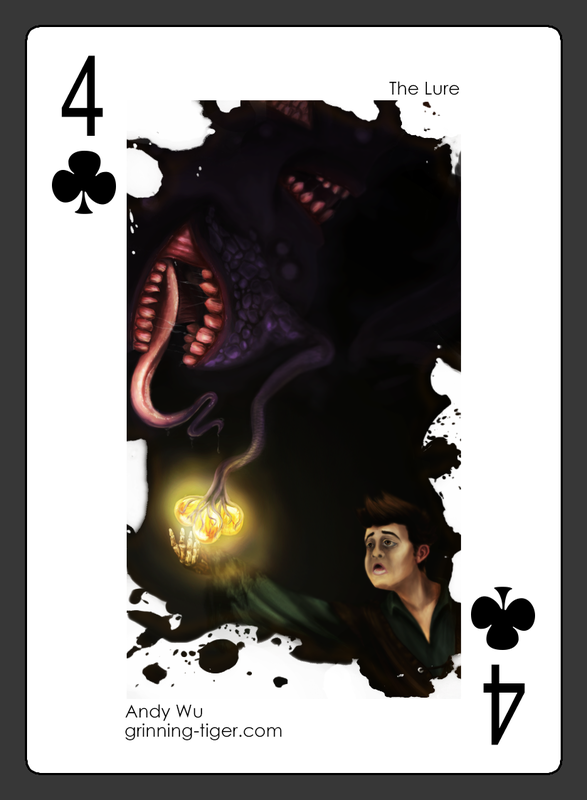 May 19th I wanted to do something along the lines of fantasy but also didn't want to do any of the face cards as I felt that the subject would be a bit too constraining. Thus I went and looked up the history and evolution of playing cards. Hearts were the clergy, spades the nobility, diamonds the merchants, and clubs the serfs. Then I recalled that playing cards were also sometimes used for fortune telling and so I went to look up the different meanings for each card. A lot of the meanings were about love and success which I don't feel like doing at this time but I stumbled upon the four of clubs which represents lies, betrayal, and changes for the worse. Four is also considered an unlucky number in many Asian cultures as the word for four sounds similar to the word for death, although I'm not sure how much of this I will incorporate. May 22nd Re-found my composition with the correct dimensions of the artwork area for the card. Blocked in some base colors and cleaned up/defined my sketch. Then I stepped back to look for reference. June 22nd After painting some more and looking at my previous drawing, I wasn't really liking the composition. It felt too far away and removed from the action. Here is a second sketch that I am trying out. 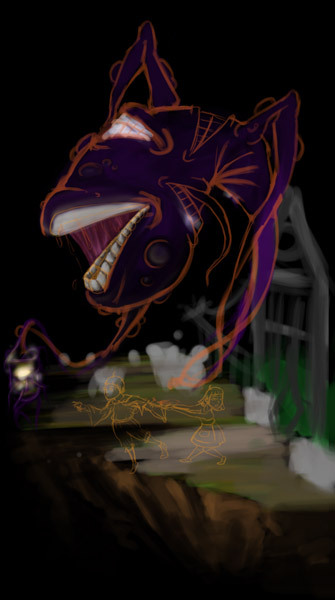 I was thinking that I wanted to add more form to my evil spirit thing instead of just having a formless blob. Since I have an angler fish protrusion thing I started to look at the head/face shapes of those fish couples with how snakes open their mouths. I'm not quite sold on how it looks currently as it feels very standard monster to me and I feel that human mouths on non-human objects are creepier. July 27th Blocking in some color and adding in some base details. I really wanted that reaching pose so unfortunately that means my human character needs to move to the side and I can't seem to fit in the girl. I tried to do a receding frontal pose but I couldn't get it to look correct and an upward stretch pose makes the character smaller than I like. July 28th Adjusted my composition with some simple gradient overlays so that the elements fit together better. Blocking in my human character. I wanted him to further convey the story so instead of going for the standard cute design that I had previously sketched in, I wanted him to look like he was stepping towards death. 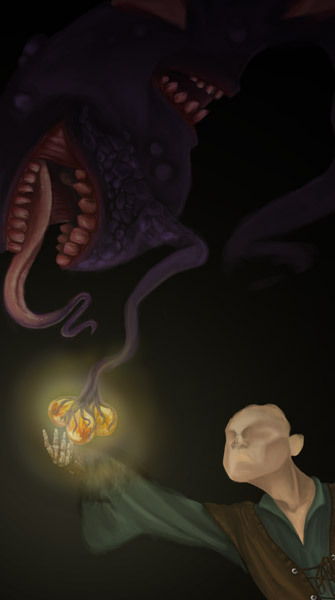 Gaunt facial features and I tried giving him a skeleton hand but I'm not sure if it works out well, especially as it is occluded by the glow. August 27th I ended up struggling a lot with how my human character looked, partially because he has ventured so far off from what I had initially design and also I usually don't do gaunt, worn down, male characters. August 30th August 31st The final deadline for the challenge so some last things to finish up during final looks. Placed it on the card and did some embellishments on the edges for integration rather than just a flat rectangle. The painting looked even darker than usual due to being against white so I did some more color adjustments, created a slight blurred layer over and masked out areas to make sure my focal point is in the right place, and then because I forgot to fix the gradient banding previously before flattening I had to go in and smooth them out manually. I was originally thinking about painting something in the background so there's more interest there, particularly as there is a large negative space between the two figures but I couldn't come up with anything worth painting. The horizon line will already be down low and the background is already so dark with the focal point being in the front that nothing that I draw back there could be seen well. Also, I have always hated painting trees and foliage. The AAU Spring Show, hosted at the Palace of Fine Arts, was amazing and inspiring. Congratulations to all those who got their work in! I unfortunately did not have anything in the show, as being my first year here, was unprepared. I was hoping to at least see my name on posters for some of the collaboratives I am working on but unfortunately no. I am looking forward to stepping up my game and getting something in to the spring show for next year, maybe I'll even try submitting some illustrations!All the work was amazing but here are some of the highlights to my evening. First, giant apologies to those artworks that I don't have an artist name attached to as I didn't get a chance to copy down and match the two together. The ones I do know the artist of is because I know them personally, so yay! 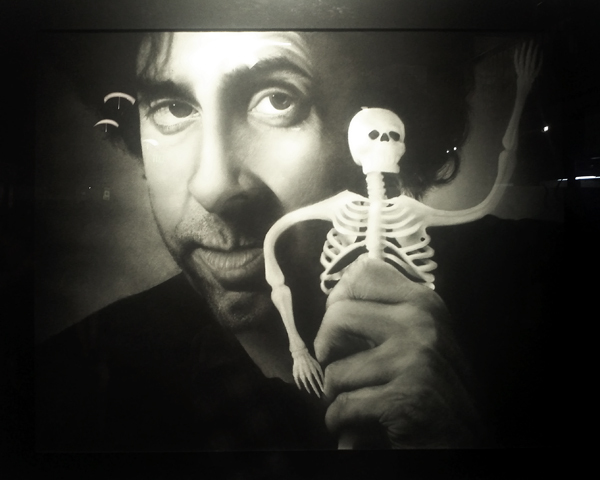 First up is an amazing drawing of Tim Burton that won best in show for the Foundations department. There was also another amazing drawing of Hugh Laurie as Gregory House but it appears that I do not have a photograph of it; probably because someone was in the way and I forgot to go back to it. I love Disney and was excited to see this amazing bust of the Beast from Beauty and the Beast. Following are a turtle head, by Joseph Jordan, and Kerchak from Tarzan, by Charles Larrieu. 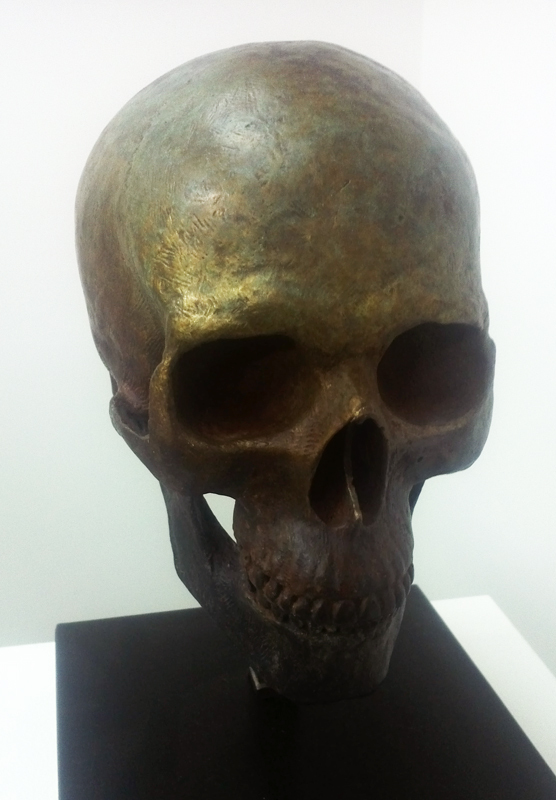 I was painting textures for "Ruslan and Ludmilla" at one point so this skull caught my eye with its detail and textures. 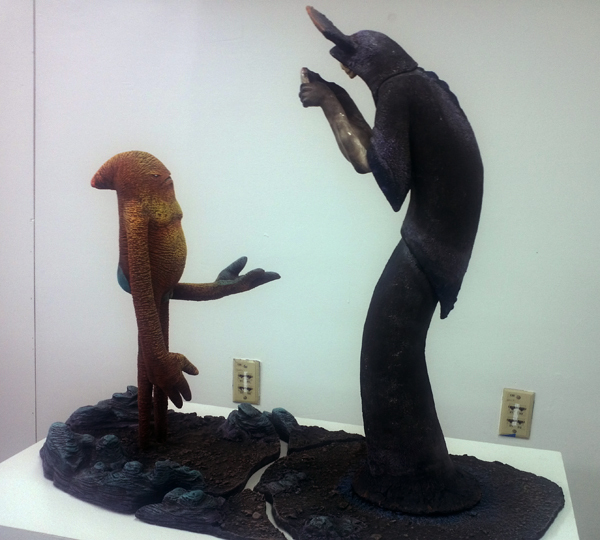 This next sculpture, titled "Give it back!" first initially caught my eye with the neat textures that made up the body of the orange and yellow character. I also love how it tells a little story. 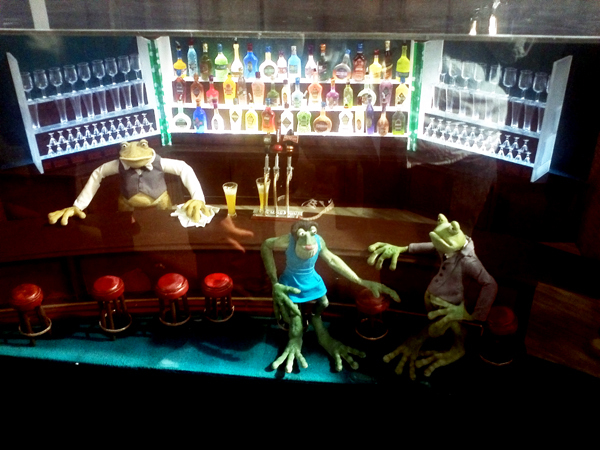 The set and puppets of "Frog Bar", a puppet animation that is currently under production. An absolutely amazing macquette by Tatiana Samoylova that was the runner up winner in the maquette category of the show. 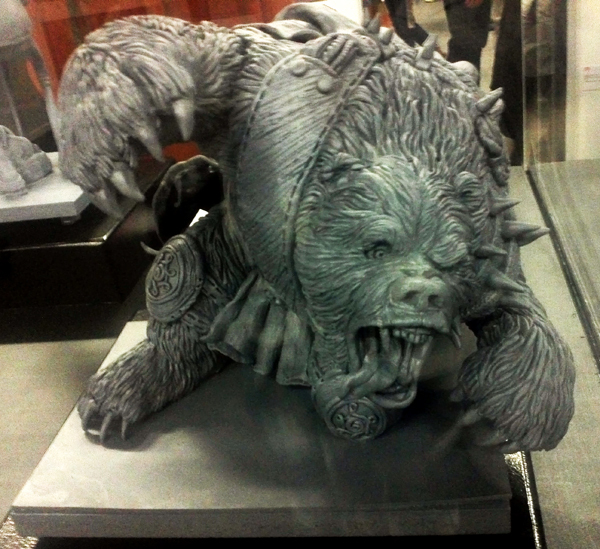 It took her, I believe, 80 hours and 12 pounds of Super Sculpty to craft the maquette. She layered all the fur for the bear strand by strand! The hard work shows and clearly has paid off. Some amazing oil paintings. I love the physicality of the brushstrokes. It made me miss my oil paints but then I remembered that I hated those things. They were a mess, smelly, and a hassle. 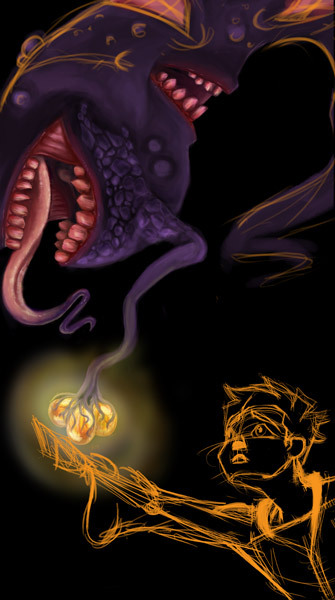 I prefer digital painting even though I do lose the nice tactile quality of working with physical materials. 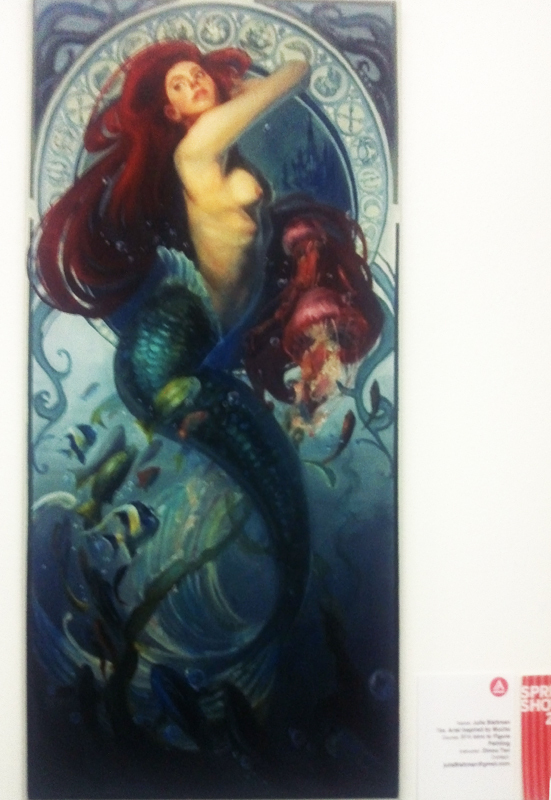 A lovely illustration of Ariel from The Little Mermaid. It reminds me a lot of Marta Dahlig's work. Particularly that giant circle thing in the back which reminds me of Marta's Deadly Sin series but is, I feel, somewhat uncalled for here other than it looks pretty. Adorable "Golden Coral Dragon"! This reminds me somewhat of Bobby Chiu's work but still, amazing and adorable. 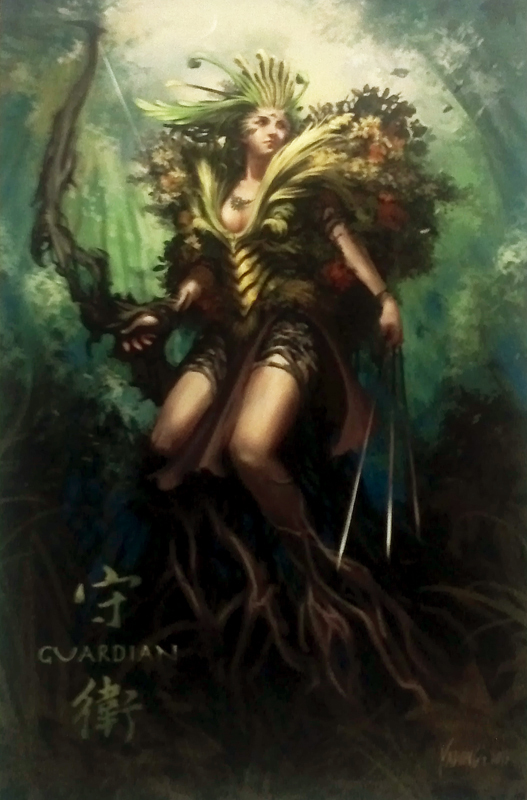 Always love the fantasy genre and so here is a very cool forest guardian that caught my eye. A character sheet for a short called "Tequila Rescue". I'm not sure who did this specific artwork, again extremely sorry, but it is for the thesis project of Rudy Waldstein and is about how a little chihuahua thinks it is a big saint bernard rescue dog. Learning how to draw anything! 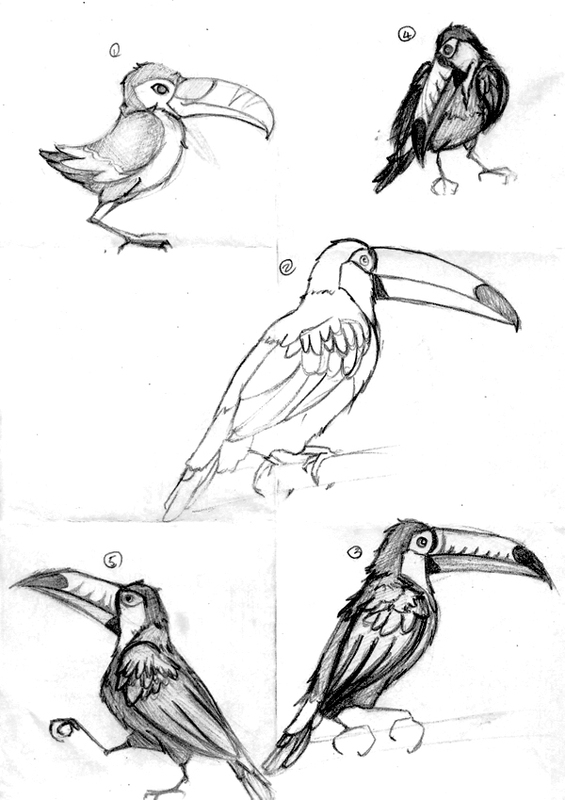 Here is a great exercise in learning how to draw anything! I learned this while at Tea Time, courtesy of Lana Bachynski. The exercise is simple with only five steps and each only takes three to five minutes. A fun way to time each step would be to play a song and however long that song lasts is how much time you have. Pick something that you want to learn how to draw. 1. Just draw. Don't look up what it looks like; draw what you think it looks like either from what you know or guessing. 2. Now go find an image and trace over it. Tracing helps you learn the details, structure, and proportions of what you are trying to draw. 3. Next draw your item based off of the image that you looked up to trace. While doing so you will be thinking about things such as basic shapes and form. 4. Draw it again but this time in a different pose or perspective. 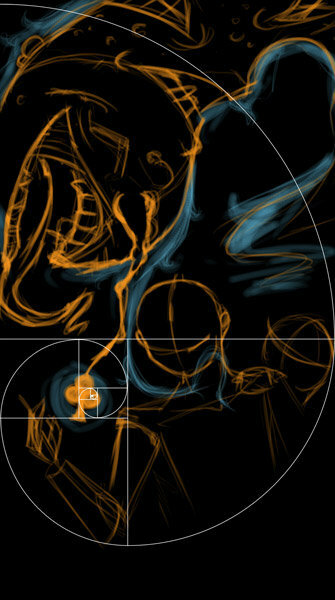 This helps you understand the physical structure and form of what you are trying to draw. 5. Now that you have a basic understanding, take everything that you learned and draw your item without looking at any pictures or previous drawings. You're done here but another great extra step that you can add in is to do 10 small thumbnails where you play with stylization of drawing your item. Push the shapes, poses, proportions, weight, and so on! This is the toucan that I did while at Tea Time! Riot, for League of Legends, has called for all digital artists to take up their styli and partake in an grand contest filled with amazingly fabulous prizes! Riot is looking for entries that depict a champion with a season 3 item preparing for battle. Take up your styli draw, and be sure to have your entry submitted by February 8th, 2013, 11:59pm. Read the full rules and guidelines. Holy crap. Riot is giving Wacom tablets as prizes, and not just any tablet but a Cintiq! I am still using a little blue Bamboo Fun that I got as a present quite a few years back so any of the prizes here would be a great upgrade, but a Cintiq is probably the most amazing and invaluable piece of hardware that a digital artist could have. Not only are the prizes great but I am also thinking of the possible opportunities. If your artwork is good enough, Riot might contact you for the highres file of the artwork so that it could be printed and hung up in their office. Additionally, as a digital artist, winning such a competition could not at all hurt in getting your name out there and known, and I am not at all opposed to working for Riot. I am looking forward to working on my entry, I have a few compositional ideas in my head. I have been practicing my painting over semester break and I believe that I have gotten better. I don't know how much of a chance that I have of winning, there are many very talented digital artists around the world and I am even expecting some entries from professionals, but I will try and at the least it will be good practice and experience towards my 10,000 hours. I had planned to go to the Cartoon Art Museum yesterday after visiting the Walt Disney Museum but that took a lot longer than I had anticipated. Before I knew it, it was already nearing 6pm, past when the Cartoon Art Museum closes and the Walt Disney Museum would soon be closing. Thus I went today and it was amazing getting to see the Paranorman exhibit and the SketchTravel exhibit. The Paranorman exhibit was really cool to see as it had all the concept art and sheets with notes detailing certain aspects about the characters. While the Cartoon Art Museum did not have the original puppet of the characters, there were plenty of maquettes in poses from the film. It was really cool seeing the figures up close and to analyze how the paint application on them. The set of Norman's house was additionally on display and that was amazing to comb over. While the actual puppet of Norman wasn't present, one of the face boxes that animators used was on display and that was exciting to look at. I particularly liked how the teeth of tongue were painted with some sort of fine glitter in it which I guessed worked really well as it looks good in the film and gives the mouth a shine without being glossy. The next part was the SketchTravel exhibit. They had out all 71 drawings from the artists who partook in the project and it was amazing to see the journey, the various artists, and the various styles that went in to the project. Previously I had thought that book was something nice but after seeing the exhibit I had to have it and so I bought one. I'm now kicking myself for not having bought it earlier, especially since there was a signing at CTN.